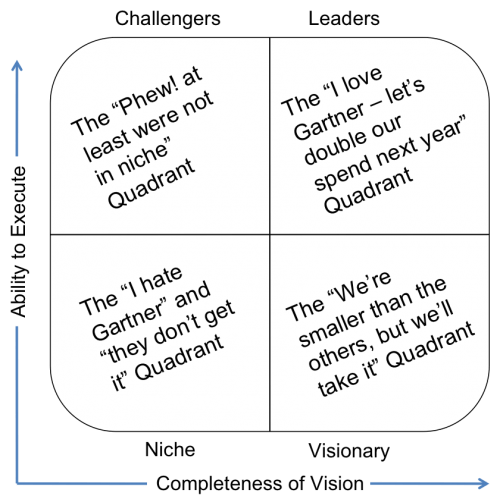 What is the Magic Quadrant, and why is it so influential? Why is it so misunderstood? Analyst relations professionals lost answers to these questions earlier this year after an error by Podbean, the company we hire to host our Influence Hub podcast. The two podcasts which answers these questions, and have had over 4,000 listeners, unexpectedly went offline. Both podcasts were corrupted, and so were the backups. In the first podcast, analyst relations veteran Ed Gyurko explains the role of the Magic Quadrant and its influence. Former Ovum analyst Duncan Chapple gives his insight into the issues. In the second, Ed and Duncan discuss some of the myths and misunderstandings about the MQ. The two discussions were recorded by Lighthouse Analyst Relations late in 2009, and are available through Influence Hub, an iTunes podcast co-sponsored by Lighthouse, Inzeption and social4sales. We’ve found and remastered the original recordings, and republished them online.